It is well known that pig heating pads provide the safest and most reliable heat for newborn pigs in farrowing. For years, farmers have raised healthier pigs with heat pads, leading to better survival through weaning and nursery. Heat pads provide the perfect microenvironment for baby pigs by providing plenty of evenly distributed heat for uncrowded, stress-free sleep. Overhead heaters, like heat lamps, fail to deliver uniformly, causing crowding and increasing the possibility of developing illnesses. Heat pads are all that are needed in a 65° F barn, allowing sows to be comfortable, eat well and maximize milk production. In such cool barns, overhead heaters generate their own updrafts. Thermal currents rise from the hot parts of the heater and cool air rushes in from below and over piglets. Heat pads eliminate problems like this by providing a solid draft barrier for baby pigs with gentle, uniform heat. A heat pad is the only supplementary heat source needed for proper piglet health and growth. The right sizes and shapes of pig heating pads allows for uncrowded piglet resting, even with today’s larger litter sizes. None of the piglets need to seek the sow for warmth, allowing farmers to send these larger litters to the nursery or wean-to-finish barn after weaning. In contrast, heat lamps and other overhead heaters force weaker pigs toward the sow and increase the potential for crushing. The broader output from overhead heaters can also overheat sows, making her restless, further increasing the chances of crushing. Centering a heat pad in the creep area keeps piglets in close proximity to the sows’ teats, encouraging increased lactation. Simply put, heat pads always keep heat available when and where it’s needed, improving piglet weight gain and health. At full power, Stanfield farrowing heat pads provide a uniform surface temperature 30-35° F above air temperature. By adding our automatic ramping controllers, surface temperatures can be reduced as growing piglets’ requirements change, saving electricity. Virtually all other heating methods for baby pigs in farrowing houses heat the wrong places and are more costly to install, operate and maintain. Check our energy consumption calculator to input your information and compare a 2 x 4’ heat pad to a 175 W heat lamp. 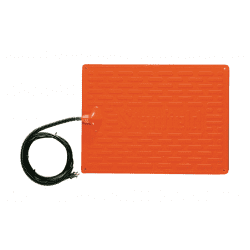 The low temperature heating element in our heat pads is durably protected in specially formulated, flame-retardant RTM-Glas™ fiberglass-reinforced plastic. Other, high-temperature methods of heating, in addition to being far less energy efficient, increase the chances of fires and other disastrous events. Your pigs would thank you if they could! Caring for pigs isn’t an easy job. They can’t physically tell you what they need, but they always find ways to show it. Both sows and piglets won’t be able to tell you “thanks” for choosing heat pads over other heating methods, but they’ll show you with comfortable rest and better health and productivity. And while your animals enjoy their heating pad, you can enjoy the peace of mind that comes from knowing you’ve provided them with a high-quality product which was proudly made by our employee owners at our manufacturing plant in the USA. Nothing can equal the reliability and safety of the Stanfield heat pad, the signature product on which we have built our reputation.